Allow me firstly to thank the Honourable Minister for honouring us with his presence here today. This is a momentous occasion – not only are we making public our financial results of the past year, we are also meeting our media friends officially today. After what started as a rather rocky relationship, I am glad that we can get to know each other better and establish a mutually beneficial working relationship going forward. You fulfill a vital role in our country’s socio-economic development as the “fourth estate” upon which all effective democratic governing systems are build. You remain a vital tool in distributing information of public interest to society in the most objective and non-partisan manner. And although we may not always agree on reports by some of your members, we respect your role in information dissemination. We trust that going forward, we can continue to forge mutually beneficial working relationships build on mutual respect. And we trust that NAMDIA will henceforth remain your first, foremost and most authoritative source of information on any matter relating to its operations. Now, allow me to go back a little in time to provide you with a brief history of where NAMDIA comes from. The diamond industry has a history of over 100 years in Namibia since the discovery of the first diamond by Zacharias Lewala whilst working on the railway line to Luderitz in 1905. A diamond rush ensued and towns like Kolmanskuppe became centres of diamond trading in those early periods. With the proclamation of what is known as the “Sperrgebiet” or the “forbidden” zone in 1908 by Consolidated Diamond Mines (CDM), an amalgamation of all diamond miners at the time, a period of monopolizing one of Namibia’s richest natural resources began. And for over 90 years, CDM dominated this multi- billion dollar industry. At independence, however, the newly established Government of the Republic of Namibia entered into an agreement with De Beers, the owners of CDM, to form a joint-venture company called NamDeb which stands for Namibia De Beers. In terms of this arrangement, GRN and De Beers would be 50:50 joint shareholders in NamDeb. At the time, the diamond industry was governed by the Diamond Industry Protection Proclamation of 1939 which allowed the industry to self-regulate through the Diamond Board of Namibia. This Proclamation of 1939 became archaic and defunct at Independence and therefore, after a thorough review of the the diamond legislation and regulations, the Diamond Act (Act 13 of 1999) was promulgated in 2000. This Act served as a catalyst for downstream beneficiation in Namibia and paved the way for new entrants into the diamond pipeline. It also led to the diversification of the industry, away from just mining and exporting of rough diamonds to dealing and manufacturing of diamond jewellery. As a consequence, more than 13 new diamond cutting and polishing companies have been established in Namibia. In 2016, a Government Negotiating Team (GNT) successfully negotiated a new Diamond Sorting, Valuing, Sales and Marketing Agreement between the Namibian Government and De Beers through which it was agreed that NAMDIA was to receive ( Please note that we buy) a Purchase Entitlement of 15% from the Namibia Diamond Trading Company (which sorts and values the NamDeb production). It must, at this juncture be understood that NAMDIA was established as Namibia’s wholly owned sovereign agency to sell and market our entitlement as per the agreement in the international diamond pipeline and to create a footprint of Namibia’s disproportionally high quality diamonds in the discerning niche market. capacities in the downstream market. One of our key highlights of 2017/2018 is that we were able to work for the very first time from our own office space and logistical hub. We moved into our new “Eumbo” building in December last year. Another significant highlight – which is pivotal to our success – is that we managed to secure the financing required to buy rough diamonds from the NDTC. It is important to note that we do indeed BUY the diamonds contrary to some misconceptions that we receive these stones for free! We are fortunate that the banks have taken into consideration our good trading and positive cash flows and have taken a leap of faith to finance our diamond pipeline. unusual high production from the mine. 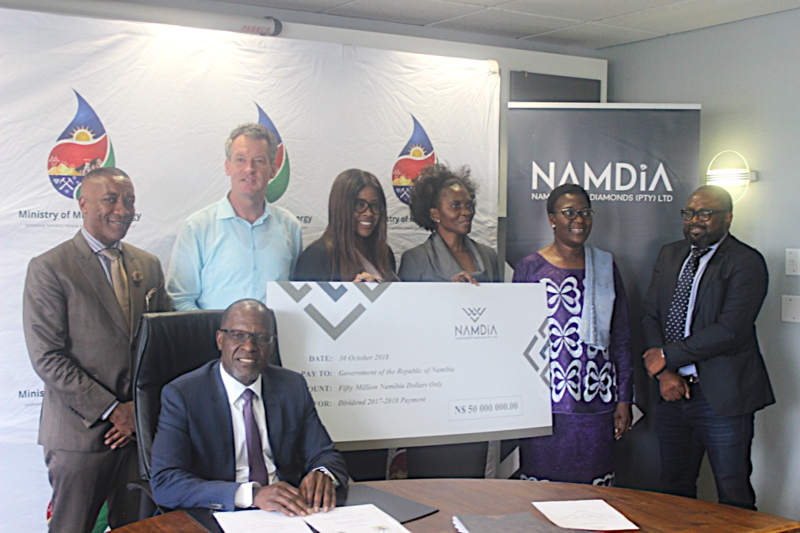 It must be noted that the Sales Agreement enables Namdia to buy its rough diamond entitlement offered by the NDTC and therefore we must buy every cycle without fail. Cash flow management is critical to our buying capacity and therefore Namdia cannot afford to stockpile rough diamonds from any cycle as such stockpiling comes with the unintended consequences of compounded higher interest and encumbered capital. It must therefore be emphasized that without a government guarantee, our cost of capital is more expensive and adversely impacts our bottom line and this impedes our yearning to declare higher dividends to the state for the year under review. Due to the lack of a government guarantee, a hundred million Namibian Dollars from our profits are retained in banks as collateral. We remain cognizant of government restraints in providing government guarantees in the current economic climate. But we are equally aware that had we been granted the privilege of a government guarantee at inception, we would have been able to pay three-fold the dividend which we are declaring today. Despite all, our total revenue for the year was almost 2 billion Namibian Dollars and we paid a total of nearly 80 million Namibia Dollars in taxes and export duties and our after tax profits amounted to 139.4 million Namibia Dollars. This financial performance is stellar and outstanding by any standard and we hope and are cautiously optimistic that this full year’s performance is an indicator of great things to come in the medium to long term. Development goals and Vision 2030. Looking ahead, the market outlook is promising in the medium term and the long term supply and demand fundamentals look favourable. However, the current market conditions are less than favourable with the threat of synthetics rearing its head as well as liquidity issues experienced in the Indian market as banks increasingly shy away from financing the diamond pipeline as a result of ongoing financial scandals within this market. Despite this however, Namdia stands strong and is able to defend margins for its assortment of diamonds. And we have demonstrated consistently that we are able to sell above the De beers price book and we have done so for every single sale since inception. For Namdia it is of the utmost importance that the mid-stream diamond pipeline is sufficiently financed as we sell most of our stones in the secondary market, to buyers that are vertically integrated, with major cutting operations and closer to the end-users and therefore their liquidity is critical for the sustainability and viability of Namdia’s operations and that of the entire diamond industry. The year under review was a good one in terms of our operational and financial performance and our clients have paid premium prices and our cash position continues to strengthen. We hope to build on this positive momentum by expanding our client base through the exploration of mixed sales strategies depending on our assortment and the qualities and sizes that the mines present to us. We remain cautiously optimistic going forward as experience has taught us that the diamond industry is susceptible to global economic traumas and negative cycles, global political instability and consumer confidence. And in a world that is becoming increasingly unpredictable with the looming threat of trade wars and global macro-economic volatility, we cannot rest on our laurels or be complacent. We will, however, keep abreast of the changing dynamics in the local and international environment so that we are better able to mitigate potential risks to our business. All agencies, offices and ministries that support Namdia and foster a conducive environment for us to do business. And to you ladies and gentlemen of the media – our doors remain open and we look forward to work with you constructively for the benefit of all Namibians. And finally I would wish to single out the Ministry of Mines and Energy and in particular the Minister, Honourable Tom Alweendo whose wisdom and guidance we embrace. I now have the singular honour and privilege of declaring our dividend of fifty million Namibia Dollars to the shareholder – the Namibian people – for the year 2017/2018. Thank you for your patience and I thank you.